Keys Coral Reef Week campers prepare to snorkel in the seagrass at Big Pine Key. 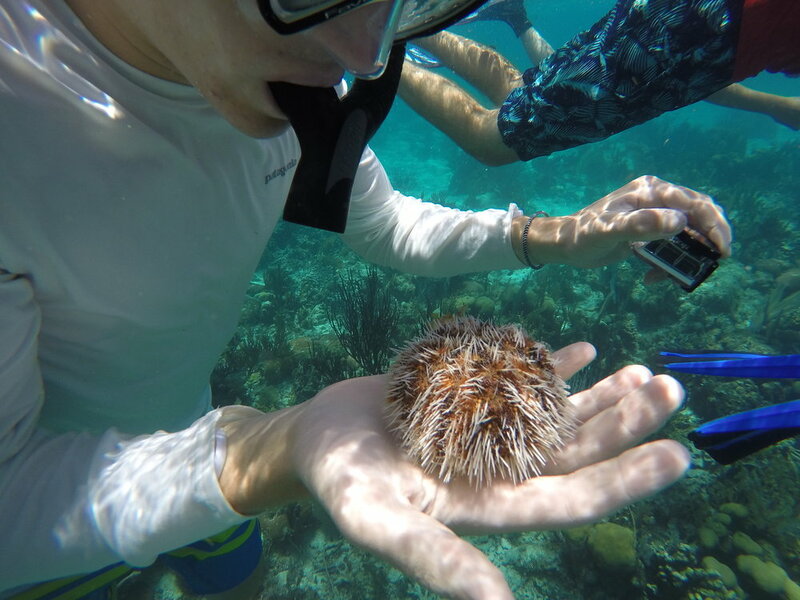 A camper holds a sea urchin while snorkeling in Belize. Keys Coral Reef Week takes place on Big Pine Key, and campers will enjoy sleeping in tents under the stars and snorkeling in the Florida Keys National Marine Sanctuary. The focus is on coral reef ecology, and exploring a completely different ecosystem than we are surrounded by in Southwest Florida. “Coral Reef Week participants can expect to see a variety of corals, queen conchs, parrotfish, eagle rays, sharks, and so much more,” said educator Shannon Stainken. “We also have campfires and a very fun tent competition each week,” she added. Two age-segregated weeks are offered. 11-12 year olds can register for July 8th-13th and 13-15 year olds can register for July 15th-19th. The cost is $575, including transportation, accommodations, and food. A coral reef expedition to Belize is planned for 15-18 year olds, and will take place July 29th - August 7th. This trip begins in the rainforest, then campers are transported to the IZE Field Station on South Water Caye, along the beautiful Belizean reef system, where the emphasis is placed on developing critical skills of scientific inquiry as students design and carry out their own research projects on the local biota. The all-inclusive cost for this program is $2,700. 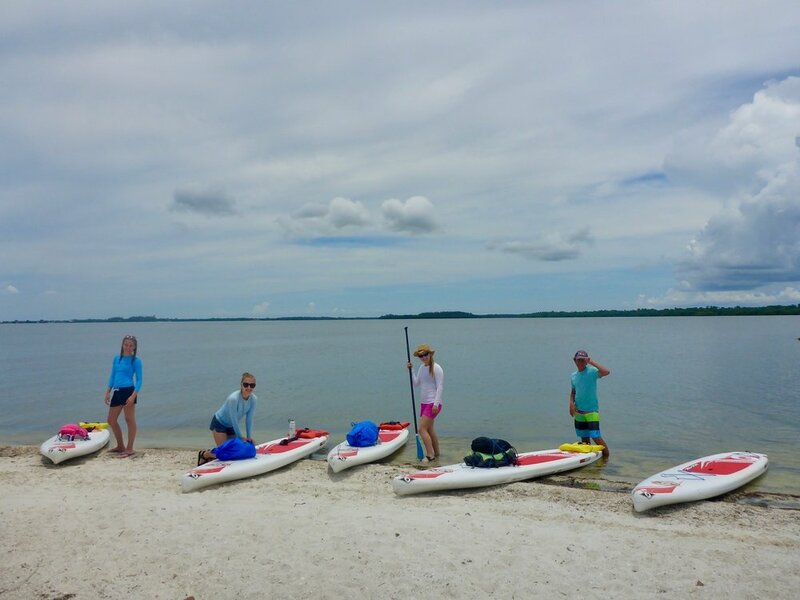 Teens can participate in a variety of paddling adventures at Sanibel Sea School this summer. Paddling camps will include Have Paddleboard, Will Survive Week from June 10th-14th, which provides an introduction to basic paddling and survival skills and culminates in an epic paddle to camp on Picnic Island. From June 17th-21st, an all female version of this camp, called Wahine Toa Week, will be offered. What’s SUP in the Keys Week is new for 2019, and will be based at John Pennekamp Coral Reef State Park. Paddlers will venture out from a different location in the Keys each morning to snorkel near seagrass beds and coral reefs. In the evenings, they will cook and enjoy campfires under the stars. This camp runs from July 22nd-26th. All paddling camps are open to ages 13-18 and cost $400. Paddlers jump for joy during a camping expedition to Picnic Island. The Cayo Costa Kayak Coddiwomple is sure to be an unforgettable 5-day adventure. Participants will launch their kayaks from Pine Island for a 7-mile paddle to Cayo Costa State Park, where they will camp, snorkel, hike, create artwork, practice survival skills, and enjoy spending time outdoors. “Surprise is really the key ingredient this week,” said program leader Kealy McNeal. “We are going to wake up each morning and decide together how we want to spend our day!” For ages 13-18, this camp runs from July 29th - August 2nd and costs $400. 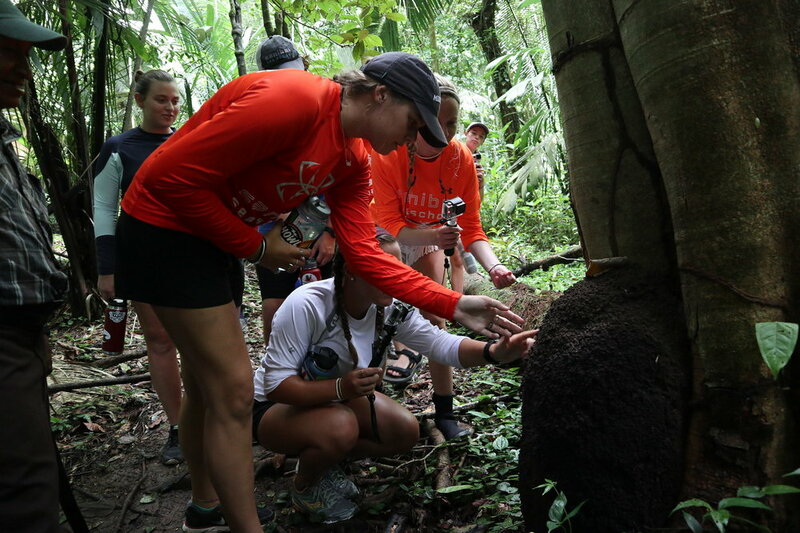 An expedition to Belize for older campers begins in the rainforest and ends at a coral reef. Sanibel Sea School is a 501c3 nonprofit whose mission is to improve the ocean’s future, one person at a time. Scholarships are available upon request for all camps. To learn more and register for camps, click here or call (239) 472-8585.